Batman perhaps more than any other comic book character has had his origin examined and scrutinized, most notably by Frank Miller in his masterfully written Year One. So when Zero Year was announced I was cautiously optimistic. The fact that Scott Snyder, who has just amazed and impressed us with Court of the Owls and Death of the Family eased many of the doubts that persistently crept into my mind. Like legions of comic book readers out there, Batman is and has been since childhood my favorite character and his origin is like gospel, a subject not to be taken lightly. Admittedly most of my concerns stemmed from the continuity discrepancies that arose from the birth of the New 52. That being said, Batman was the least impacted by these sometimes drastic changes. His origin is not so much changed as it is more fully explained and some of the blanks are filled in by Zero Year. There are years in Bruce’s past that have yet to be addressed, formative years in the Batman mythos. 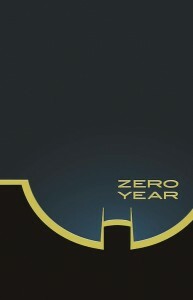 Scott Snyder does an excellent job here of driving away the shadows that remain and linger around some of those years. The story begins six years ago – Gotham City is in utter disarray, looking more like the Savage Land than a major municipality. Scott Snyder, more than any other writer, writes Gotham City as another character. He gives it life and personality and Greg Capullo enhances this effect by rendering the city as though it were a living organism. A child is spear fishing in the flooded entrance to the Gotham subway when suddenly he is assailed by a pair of mask-wearing thugs .He drops his fish and runs for his life. Batman shows up in a tattered makeshift uniform minus cape ,riding a dirt bike that looks like it was used in a Mad Max film. He saves the child and returns his dinner to him. The time line jumps further – it is now five months earlier and The Red Hood makes his appearance but just who is under that hood at this point is not known. Bruce is heavily disguised and driving a truck full of men that The Red Hood is quite interested in killing for refusing to join his gang. This sets up an edge of your seat escape scene and shows a more reckless Bruce at a time when he was more likely to take chances. Bruce returns to a pre-Bat Cave headquarters which appears to be a secret room full of computers and training equipment hidden inside Wayne Manor. Here Bruce and Alfred discuss the state of modern crime fighting. Snyder is a master of writing dialogue. The conversation flows with a natural rhythm that lends a deeper level of credibility and realism. The discussion is complex without being pedantic and illuminates a deepening relationship between two friends. Bruce’s Uncle Philip plays a major role from here on out. He shows up and takes Bruce on a drive around Gotham to show him the new Wayne Enterprises building. As an interesting detail we are shown the giant penny that we all know will come to be housed in the Bat Cave. It stands before Wayne Enterprises as Uncle Philip tells the story of overseeing its forging. He also gives us some history of the relationship between the Wayne family and the Kane family. Snyder then takes us back to a time when Bruce was a boy. He sees his father working on an old Lincoln and runs happily to him. His father looks lovingly into his eyes and what follows is some of the most revealing dialogue in the book. Bruce explains his desire to be anonymous and that his love for Gotham stems from the fact that he can be anyone he wants when he is in the city. His father then shows him a visual mapper designed by Mr. Fox to be used by fire-fighters, EMTs and doctors. It makes a three dimensional map from inside the rubble of a collapsed building or destroyed village. I can’t help but think this is going to be a significant piece of equipment in the near future, perhaps in the construction of the Bat Cave. Uncle Philip returns for the final pages and has a conversation with a rather unexpected co-conspirator. A dark and foreboding solution is proffered to Philip’s quandary, one that echoes across time and space as we see Bruce as a boy reflected in the shiny visual mapper held in his tiny hand. In the final panel he stands contemplating a gaping hole at his feet. 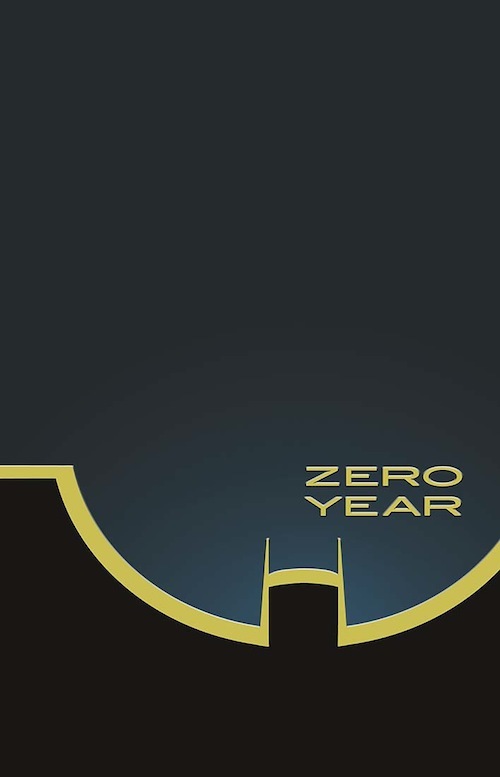 Zero Year is not the re-telling of Batman’s origin that some may have been expecting. It has so much more ambition than that. Scott Snyder is writing his own entry in the history of the greatest of all comic book heroes, filling in some of the gaps and bringing the Dark Knight into sharper focus. Snyder’s engrossing and meticulous dialogue brings these characters to life. His fast paced and absorbing plot is the perfect framework for the exhilarating action sequences. Zero Year is the total package, not only does it have everything a great comic book should have but it is an endearing human drama as well. Greg Capullo continues to deliver some of the best pages on the racks today. His hyper-detailed cityscapes and exhilarating action scenes are the stuff of comic book dreams. He has been the perfect collaborator with Snyder to bring us these stunning Batman stories. Not since Grant Morrison and Frank Quitely’s groundbreaking pre-New 52 run on Batman and Robin have I been so thoroughly and completely impressed by a creative team on a Batman book. The back-up story is a look at a nineteen year old rebellious Bruce in Rio de Janeiro, also by Snyder this time with the help of his Talon collaborator, James Tynion IV and art by Rafael Albuquerque. The story highlights Bruce’s firm resolve to do the right thing even though his methods may seem drastic. The writing is again top-notch, the break-neck pace and snappy dialogue rocket you through the narrative in no time flat. The art is more stylized but fits the material. The flowing lines, blending colors and blurred backgrounds give you the very definite feeling of speeding through the streets of Rio. It is a short but intriguing look into another of Bruce’s formative years. Zero Year is off to an immaculate start. Over the next year we are to be witnesses to the birth of the Dark Knight. Some of the questions we have always had about why things are the way they are in the complex mind of Bruce Wayne will surely be answered while others are more fully explained. This book is mandatory reading not only for Batman fans but for all lovers of great writing and tremendous artwork everywhere. So even if you are only a sporadic reader of the Bat-titles I would recommend jumping on at least for the next year. I’m sure you will stick around.